The other day I was leading a meditation group which begins with about thirty minutes of meditation, followed by a talk and a discussion. As is so often the case, especially in these evening groups, shortly into the sit, I saw a fair number of heads bobbing in sleepiness and eventually coming to rest upon their chests. It’s a very common phenomenon in meditation. We get quiet and still, the eyes close and the body thinks, “Ah I know what this is- time to sleep.” And yet, if we go back to our original, deep and true intention to practice meditation, many folks will say it is because they want to “wake up”, to awaken to this extraordinary life, so we don’t miss it; the whole range of experiences and to our true nature. We know that we won’t be here forever and so we may come to meditation as a way to train the mind-heart to be fully present and alive while we are here, even when, or should I say especially when, times are tough. There is also desire, restlessness, anger or aversion, and doubt. I won’t talk about them here. I want to get back to the other night, and what happened in the midst of our sit. Sometimes if I see a lot of bobbing heads and slumped over bodies, I might gently drop in a reminder to just check in with questions like,“ Where is the mind now? And how is the attention? What is the quality of attention?” And I might suggest a few ways to support the practice right in that very moment… “If you’re noticing sleepiness you might put some energy into lengthening the spine, open the eyelids slightly with a soft gaze…if you’re mind is very busy and the body is restless, without any judgment or criticism at all, return the attention to the feeling of the body breathing, feeling the rise and fall of the abdomen . You may kindly label, “Ah thinking is here, impatience is here”…and then back to awareness of breathing. The practice is endlessly forgiving, we can start again with each breath and each new moment..” Then I let go and leave the group in silence to work with their own experience, knowing first, they can do it! And secondly this is an important part of practice, working with what ever arises in the silence. I tend towards experiential interactive teaching, so I began by getting folks into pairs and giving them a handout with these images on it. 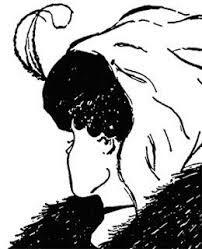 I asked how many people saw a young woman and how many saw an old woman. Then suggested that they help each other see what they could not see. 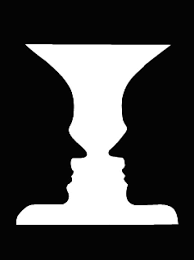 We did the same with the vase and two faces. It was delightful to witness the playful and helpful way they showed each other another way of seeing the images. After the exercise I asked if there were any insights or learning from the process. The woman whose cell phone had gone off said; “I realized that there was no right way to see it, just different ways of seeing it. And this helped with the way I felt when my cell phone went off. I was feeling so terrible about interrupting everyone and imagined what people might be thinking of me, and I was thinking of myself! ‘Oh I’m so thoughtless, I’ve disrupted everything, and on and on…’ I was really hard on myself. But after the exercise, it all loosened up. I realized it wasn’t that big of a deal and I didn’t have to make a wrong or right out of it. It just was”. “Thank you for sharing that”, I said. “Would you like to have yet another perspective?” She nodded. I continued, “I was happy it rang, because so many people were sleeping through the meditation and it woke them up!” And then I shared with her about “The Sneeze of Enlightenment.” She laughed. Then I asked the group what they experienced. “Since it was a snappy tune, I started slightly dancing in my seat, it lightened me up. Sometimes I take myself too seriously.” one man shared. “I was your neighbor,” said the guy sitting next to her. “What came to my mind was a phrase I learned long ago; ‘Everything Belongs’. When I heard your phone, that’s all I thought, ‘everything belongs’. Something is only a distraction if we decide that is, if we call it that. But if I say, ‘Everything Belongs’ then your cell phone ringing belongs, you belong, and when you got up, I sensed you were feeling badly and I started sending you love.” By this time she was beaming. One of the many things I so love about teaching is, that I am always learning more than I am offering. I am always being reminded that everyone, as the Buddha said, is essentially wise and whole, and has a good and kind heart. He did add a caveat however. He said, “We fail to see it because of our upside down views”. So all we are really doing when we practice and we share our experiences is up righting those views. As the woman who felt so badly about her phone ringing in the silence, learned, ‘everything belongs’, including her. And her cell phone. The people around her were actually not filled with blame and condemnation, but with love, appreciation and even joy. I invite you to reflect on some view you are holding that is troubling you, causing you perhaps to constrict and to suffer, and consider that there might be another way of seeing it, even if that is not clear to you right now. Then, softly and kindly try the phrase, “everything belongs”, and see what happens. See if you can do this simply as an experiment with no particular agenda. Do I know what will happen? Of course not! But as the so called students showed me, it is certainly worth a try.